The Stiffel Arlington 1 light swing arm floor lamp in burnished brass with off white shade is crafted from the finest materials. Cast zinc construction, with burnished brass finish plate, this classic floor lamp combines integrity of design and hand craftsmanship. Featuring a sturdy base and turned decorative stem supporting a double hinged swing arm that allows you to place the light just where you want it. Supplied complete with a 17″ off-white Camelot shade. This is a versatile, highest quality swing arm floor lamp that features exceptional workmanship and classic style. It stands 168cm tall and looks fantastic in a living room or dining room behind or alongside your favourite chair to make reading or any task much more comfortable. Supplied by Elstead Lighting and designed and manufactured by Stiffel in their New Jersey factory. If you take pride in possessing the finest, then Stiffel should be your choice. 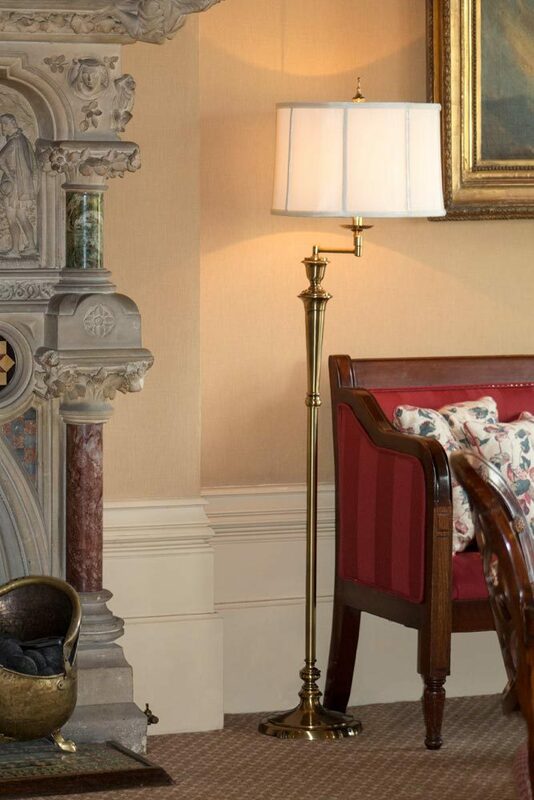 Precise craftsmanship and exceptional design combine to make lamps such as the Arlington 1 light swing arm floor lamp in burnished brass with off white shade you see here.